LAS VEGAS, NV--(Marketwired - Nov 17, 2016) - Digipath, Inc. (OTCQB: DIGP), an independent cannabis lab testing and media firm, believes that Nevada's recent approval of the recreational use of cannabis will push the industry to more standardized lab testing practices, resulting in a highly favorable long-term impact on Nevada's cannabis lab testing market. The combination of shifting public opinion and success experienced over the past two years by legal medical and recreational cannabis states has given rise to the passage of new cannabis regulations and has offered voters the confidence to pass new legislative initiatives, as reflected by the outcome of the 2016 elections. In the recent November elections, Nevada residents voted to legalize recreational cannabis, a move that enables the state's 42 million yearly visitors to purchase and consume marijuana legally. Nevada, along with California, Massachusetts, and Maine now join Colorado, Washington, Oregon, and Alaska in legalizing marijuana for adult recreational use. Recreational cannabis in Nevada is estimated to generate more than $1.1 billion in tax revenue and economic activity over the course of the law's initial eight years, according to a study by Las Vegas-based RCG Economics. For the first 18 months after the legalization of recreational marijuana, current medical marijuana state registration certificate holders (dispensary owners) will have priority on building new facilities for recreational marijuana. That includes new dispensaries, cultivation and testing facilities, and manufacturing facilities for paraphernalia. Todd Denkin, President and COO of Digipath, commented, "As the Nevada recreational market becomes operational, the increase in the number of potential consumers and cultivation facilities is expected to push the industry's focus towards more standardized cannabis lab testing and recognition of the value of the data collected through the testing process in ensuring consumer safety. Commercial cannabis cultivators and producers understand that laboratory testing is one of the vital platform technologies in the cannabis marketplace, and it must become standardized, consistent, and robust in order to maintain the long term health of the cannabis industry." Digipath Labs' state-of-the-art Las Vegas laboratory was developed to elevate the standards for cannabis testing. The team carefully selected equipment and verified standard operating procedures (SOPs) to ensure reliable, replicable results. Digipath intends to continue adding new customers in Nevada as they come into the market and to work with The Association of Commercial Cannabis Laboratories and the Conference of Western Attorney's General to instill good laboratory standards and practices around the country. Digipath, Inc. is an independent cannabis testing and media firm that supports the cannabis industry's best practices for reliable testing and delivers cannabis news coverage and education about the cannabis industry. 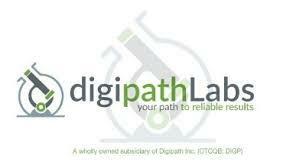 Digipath's two business units are Digipath Labs and TNM News Corp. Digipath Labs™ is working to set the industry standard for testing all forms of cannabis-based products using FDA-compliant laboratory equipment and proprietary standard operating procedures (SOP) to ensure product safety and efficacy. TNM News Corp. has pioneered a cannabis-focused news network, The National Marijuana News, that delivers news, interviews, and education on all things cannabis. About this company DigiPath Inc.